The design of pupils’ desks varied from school to school. 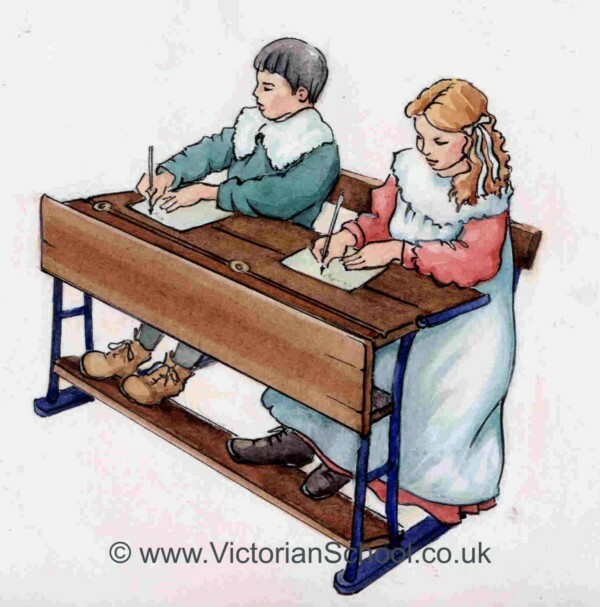 In some schools they were long benches at which four to eight pupils sat, while in other schools desks came in pairs. Where classes were mixed, boys sat in one area and girls sat in another. Usually a bench was provided for sitting on, and in the case of iron framed desks was fixed and an integral part of the design. The teacher usually had a high desk, sometimes on a platform, so that he could see the class clearly. You may use this image for non-commercial purposes without charge, but you must not alter it or remove the copyright and attribution. If you wish to use any of our images for commercial applications please contact us.